Our quality is EXCELLENT! This is also borne out by the numerous certificates and distinctions conferred within the parameters of reputed foodstuff tests. But why is this? 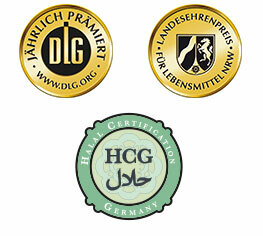 It's quite simple: Ensuring that our döner products are of a high quality is our primary objective. Beginning from the purchase of raw materials from certified dealers, through modern manufacturing, right through to timely delivery with in-house logistics facilities, for us first-class quality is the measure of all things. The satisfaction of our customers is our supreme objective. Ensuring the quality of our products is our most important task. Ensuring sustainability when procuring our raw materials and avoiding any negative impact on the environment are issues close to our heart. Our interaction with customers, staff and suppliers is characterised by mutual trust, respect and fairness. Our trend-setting döner products taste first-class.